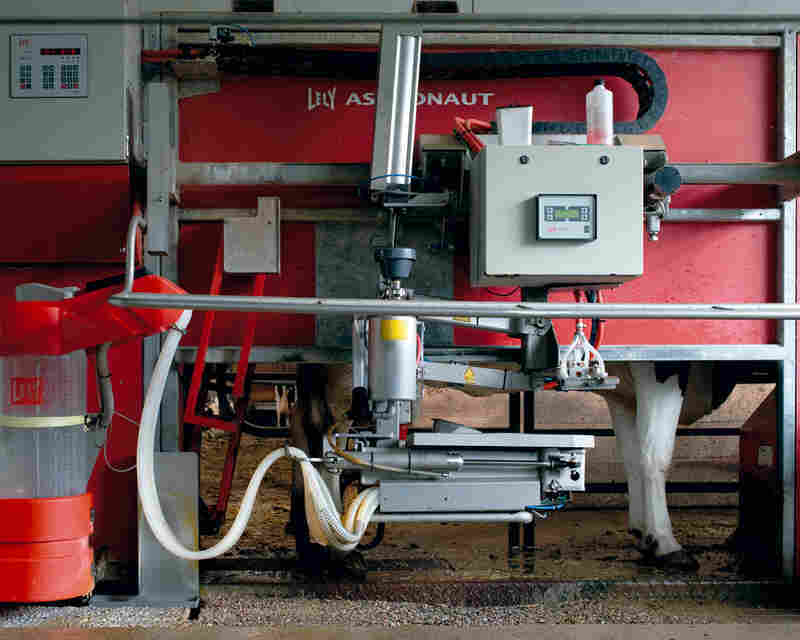 This Milk Production Was Brought To You By A Robot : The Picture Show This looks and sounds more like sci-fi, but this is nonfiction farming. Photographer Freya Najade journeys into the evolving state of Europe's agricultural system, observing fewer humans, more robots and, oddly, less and less time outside. 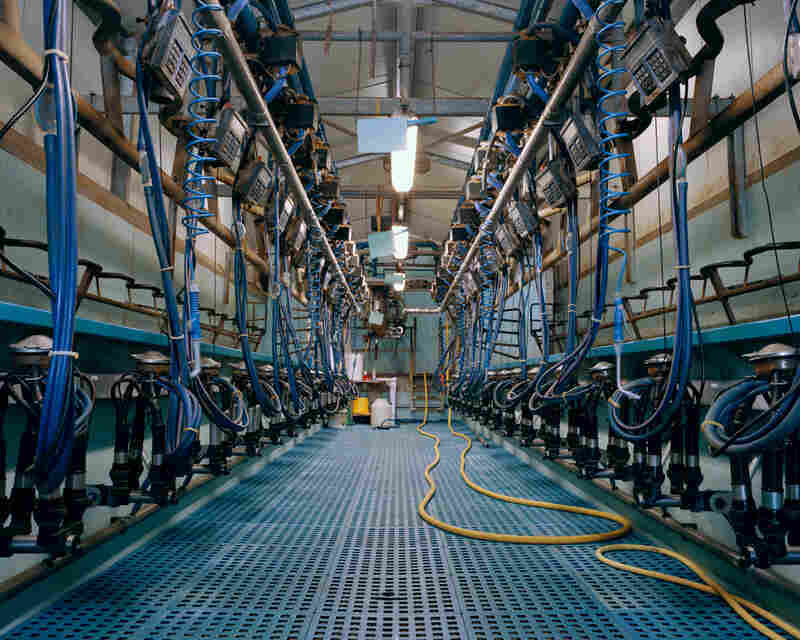 Milking Robot I, 2012: One milking robot milks three times per day, 60 cows. The cows are in a stable, in which they can move around freely. They can use the robot whenever they need to. No human needs to be present. Milking Parlor, 2012: Two people are needed to milk twice a day, 300 cows. 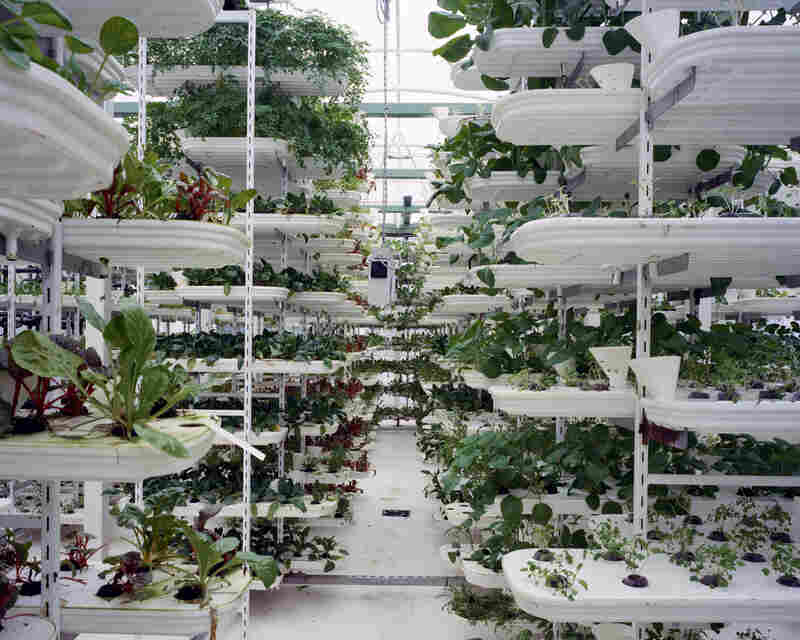 Lettuce, 2011: Lettuce is grown in a stacking system to provide a maximum use of space. Plants grow inside of plastic trays without soil. 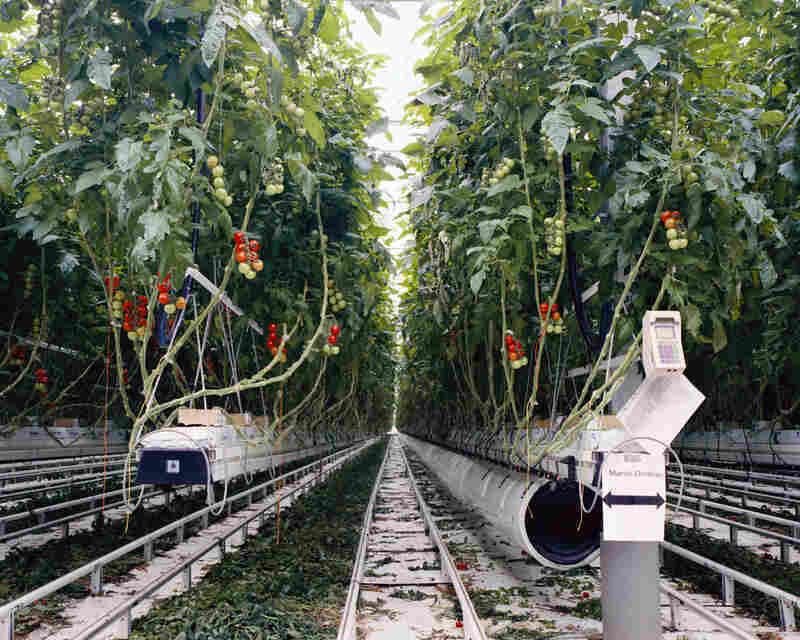 A conveyor belt is moving the plants to ensure they get all round sunlight. The whole growing process is computer controlled. Tomatoes I, 2012: In order to have total control over the nutrients and the irrigation, tomatoes are planted in sterile material such as rock wool and not in soil. 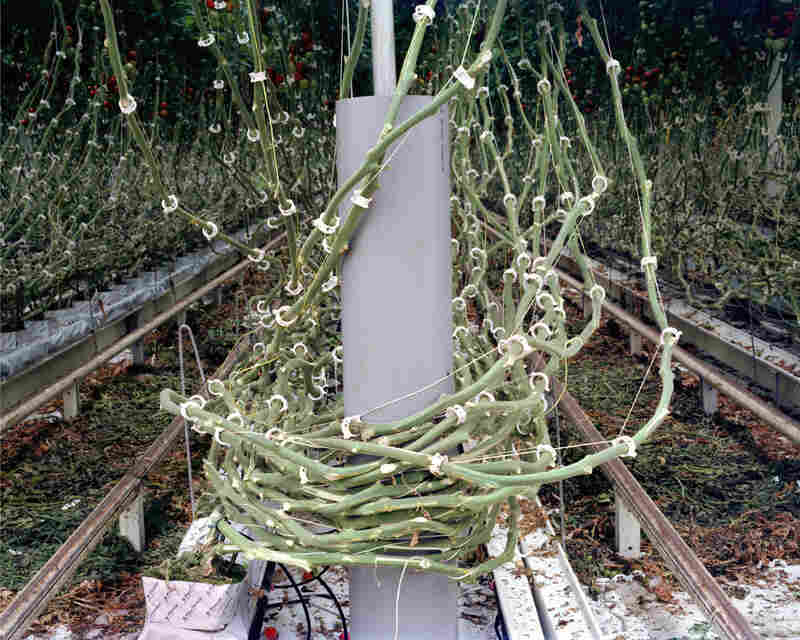 By doing so, the tomatoes are, according to the growers, less likely infected by diseases, a smaller amount of pesticide is needed and the yield can be increased. Tomatoes II, 2011: In order to consume locally grown tomatoes in ... the U.K. or Germany, the tomatoes need to be produced in heated greenhouses. 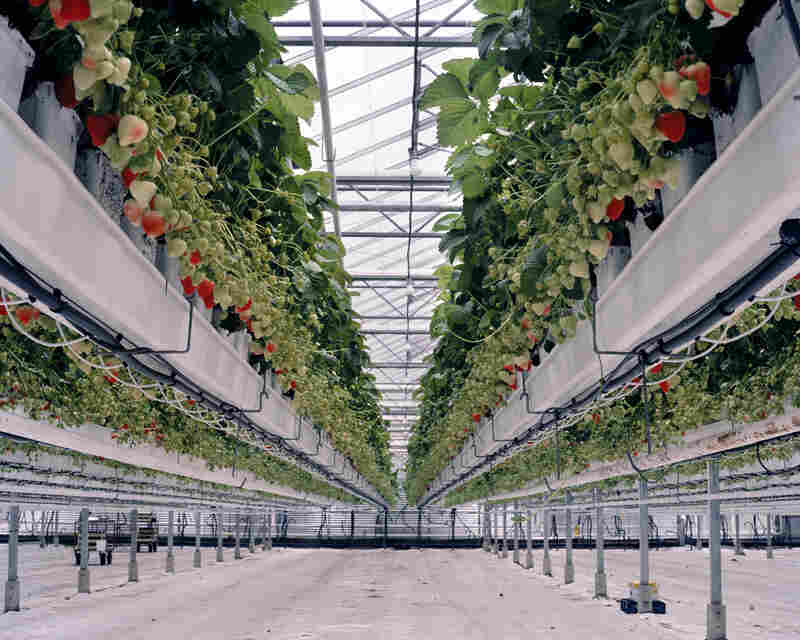 ... To produce in more sustainable ways and to keep the cost of energy low, the greenhouse above is heated by the waste heat from a nearby nuclear power station. 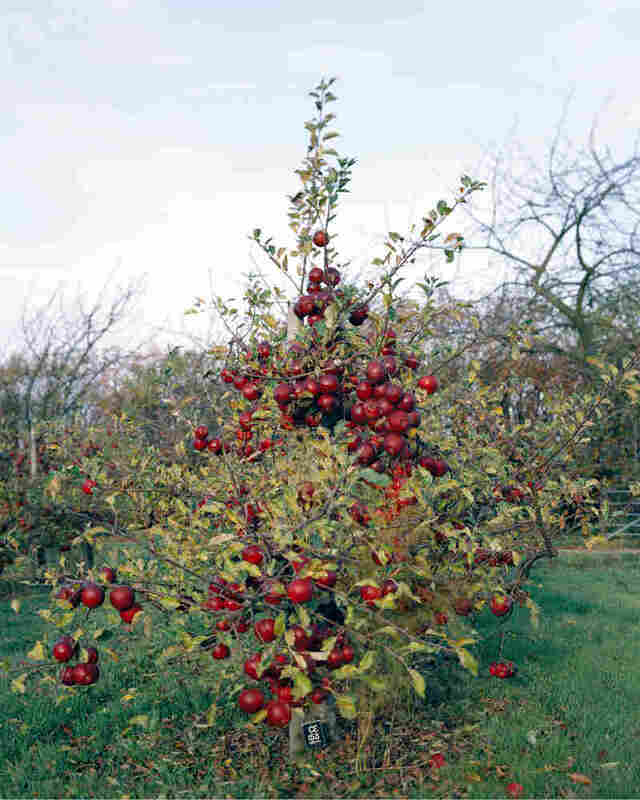 Apple Tree, 2011: Modern apple growers use apple varieties that are grafted onto Dwarfing Rootstocks. Developed at a research station in the U.K., these ... trees need less water and less space than traditional apple trees, which makes high density planting possible. The fruits are more accessible and easier to pick, because the trees are smaller. Eggplants, 2012: A computer manages precisely the irrigation, the nutrients given to the plants and also the climate inside the greenhouse. Automatically windows open, sunscreens move, and waste, water and nutrients are collected, purified, and recycled. 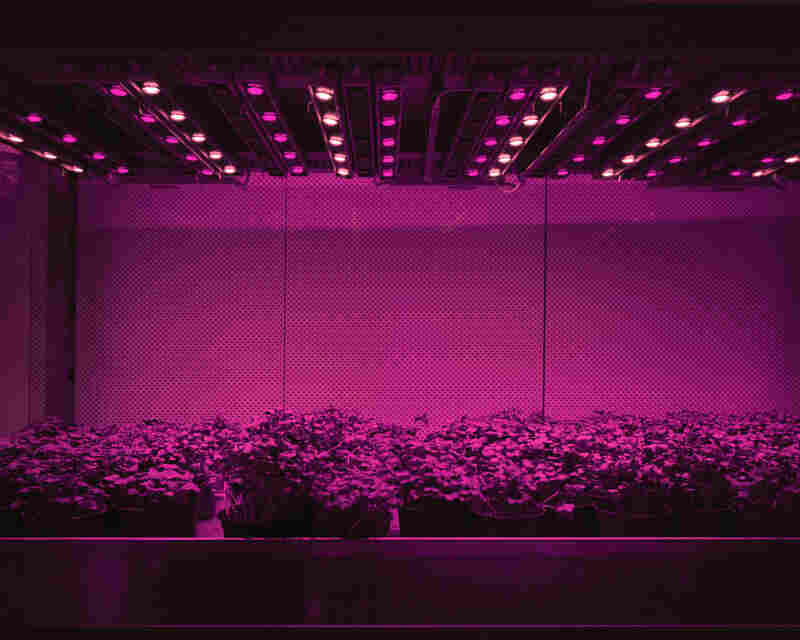 Cress, 2011: Cress, tomatoes, cucumbers, or lettuce are grown in closed systems just with LED lights. There is no sunlight and no direct exchange of air with the outside. Day and night, summer and winter stop existing. Humans are able to determine the shape, taste and color of plants and fruits. They can be grown anywhere from the desert to inside of restaurants and supermarkets. Strawberries II, 2012: Strawberry crops are grown on tabletop-raised beds. The tabletop system makes it easier to pick the fruits and eases the weed and pest control. A leaf and sap analysis determines the nutrient's compound, which is fed with the irrigation water. To accelerate the growth of the plants, growers above add CO2 from a close-by Shell refinery. Mushrooms, 2012: To allow an all-year-round production of mushrooms and to increase the yield, mushrooms are grown in a microclimate inside growing rooms. 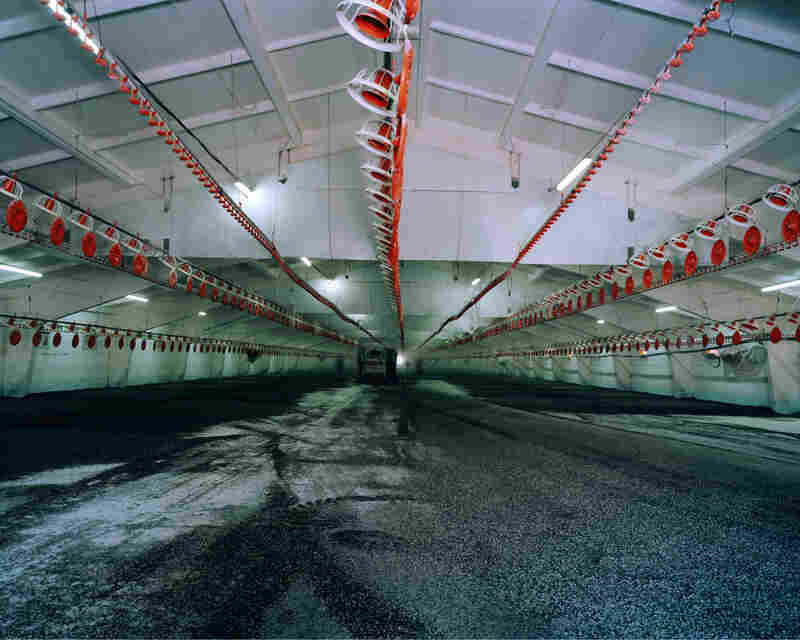 A stacking system maximizes the production per square meter. Chicken, 2011: Since the mid-1990s the consumption of chicken has increased by 75 percent worldwide. Chicken are often reared in barns. One chicken barn has the capacity to rear 50,000 chickens. We all have an inkling of how our food is grown these days, but increasingly we don't really know what it looks like. 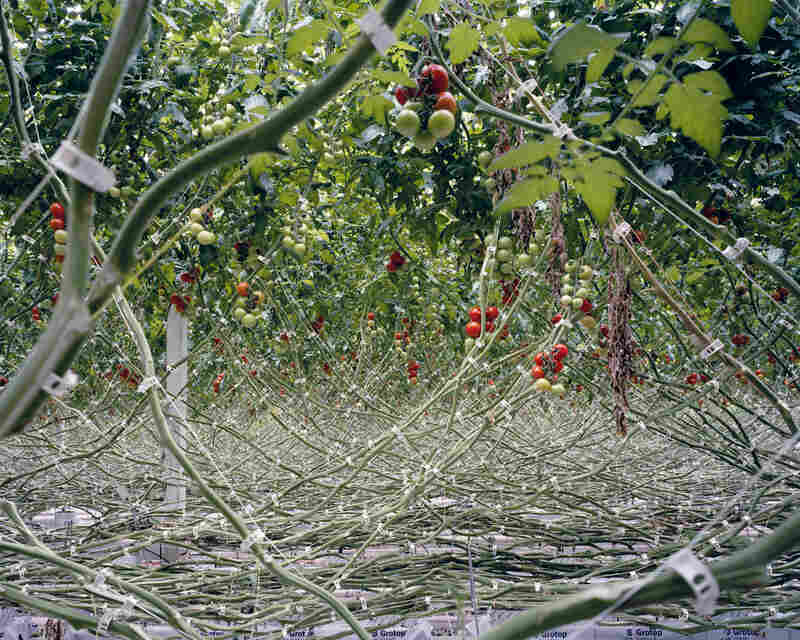 You'd probably recognize a tomato plant or a cornfield — but these photos offer a perspective that a lot of us haven't seen. Photographer Freya Najade is exploring the age-old question of how humans harness nature — a question as old as agriculture itself. But what she uniquely captures here is the latest chapter in the evolution of food production, in which technology — in the form of robots and computers — is the central character. "I have seen new technologies that allow, in certain aspects, a more environmentally friendly production. 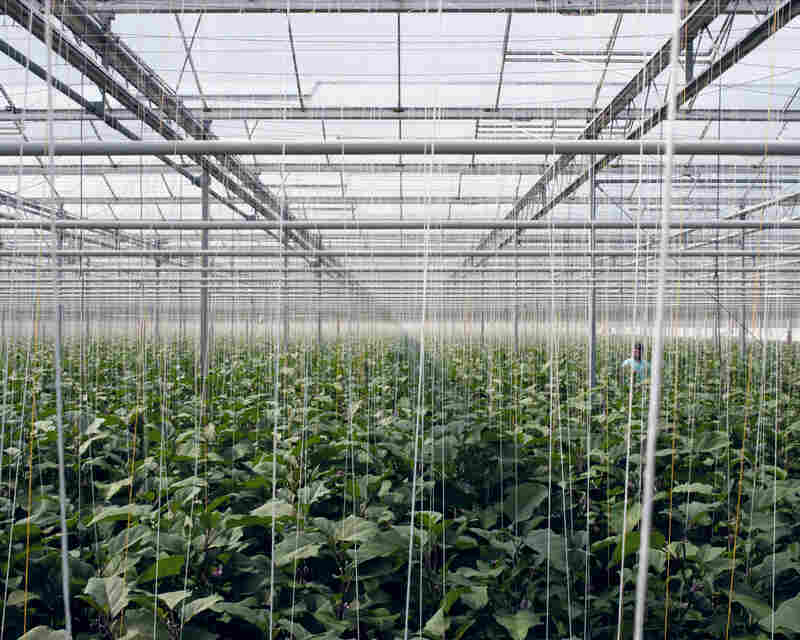 For instance, in a greenhouse in which waste, water and nutrients are collected, purified and recycled, the production becomes more environmentally friendly because less water and nutrients are needed." The fact is there are just so many of us to feed. And it's going to take some real ingenuity to feed the billions more joining us — even if that means growing lettuce under LED lights in a building in a desert. 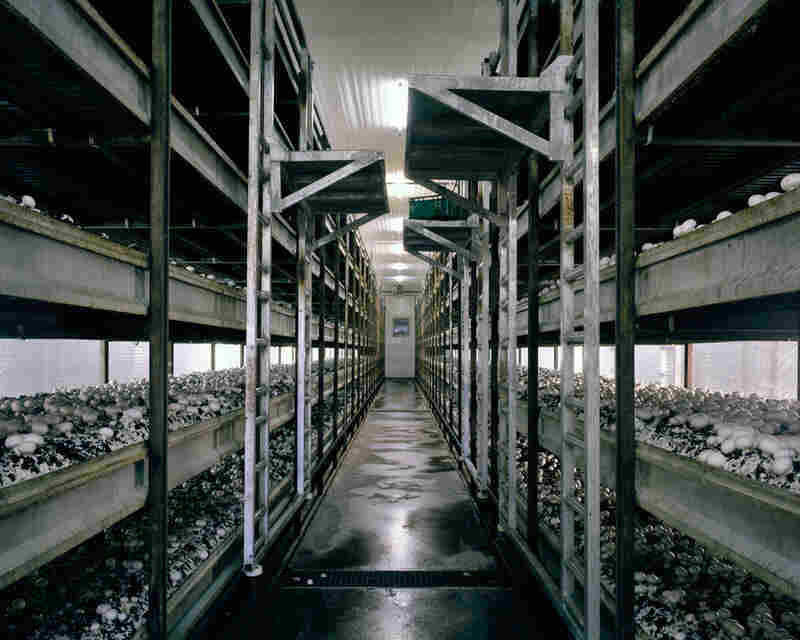 Though industrial-scale mushroom production is nothing new, in Najade's photos it looks a lot more like a science experiment than the romanticized agriculture of bucolic farms. But they're both, effectively, always a kind of experiment. Who's making the decisions about how how we'll be growing the next generation of fruits and vegetables? I hope there's another photographer out there who wants to find out. For now, though, we have Najade, who's forcing us to ask, "Remember when humans actually milked cows?" Maybe one day we'll be asking: "Remember cows?"